The Guatemala 2019/20 home and away kits were unveiled by the Federación Nacional de Fútbol de Guatemala and technical sponsor Umbro on Tuesday night. The new home uniform will make its debut on the field when Los Chapines meet Costa Rica in international friendly action. 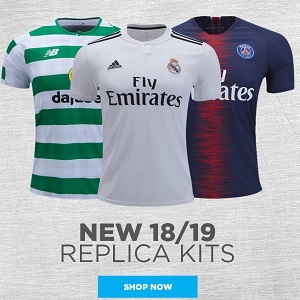 Both jerseys are expected to be on sale at World Soccer Shop. The Guatemala 2019/20 home and away kits use clever bespoke designs from Umbro. The home shirt in in the familiar white with a large blue frontal sash of the former Copa Centroamericana champions. the first time ever the sash is made up of series of angled lines that varying in their degrees of separation throughout. The sleeves and shoulders of the jersey are light blue while the collar is in the blue of the Guatemalan national flag. Guatemala’s 19/20 away jersey sticks with the team’s usual mainly blue colorway. The blue at the sleeves and shoulders is in a darker shade of the color than the rest of the kit. Tonal diagonal lines add detail to the front of the shirt. Both kits feature rubberized bands of Umbro’s famous double diamonds at their sleeve cuffs. The effect has been a fixture on all of the UK-based firm’s soccer jerseys since last summer. Made up of a roster of mainly locally-based Liga Nacional de Fútbol players, Guatemala is currently ranked 149th in the world by FIFA.